Around the world, investment continues in efficient new turbine technology and long-term service agreements. Sean Ottewell reports. PTT Utility Company Limited, which generates electrical power and steam for Thailand's industrial sector, has signed a long-term service agreement with GE valued at more than US$40m (EUR30m). The 13-year contractual service agreement (CSA) includes power output efficiency, reliability and performance guarantees for eight GE Frame 6B gas turbines at PTT Utility's power generation plants at Map Ta Phut industrial estate in Rayong, Thailand. The gas turbines are generating more than 300MW of power and 1200t/h of steam for the petrochemical industry in Thailand, which is enough electricity for more than 15 petrochemical plants with high efficiency, reliability and performance of supply. PTT Utility is a subsidiary of PTT Plc, the national oil and gas company of Thailand. "GE will help PTT Utility effectively manage its gas turbine services budget while maintaining the plant's high reliability and performance," said Kovit Kantapasara, country executive, GE Energy, Thailand and Indochina. "Our service agreement includes reliability and output/heat rate degradation guarantees, to ensure that the plant continues to meet its production targets." The CSA with PTT Utility follows a 13-year service agreement GE signed last year with PTT Chemical, to ensure the long-term reliability of nine GE gas turbines at PTT Chemical's site, also located in Map Ta Phut industrial estate. In a second new contract, GE is providing engineering, equipment, spare parts and services for a gas turbine upgrade project that will significantly increase the efficiency, output and revenue of the Kot Addu Power Company Limited (KAPCO) power plant in Pakistan's Punjab province. The project supports the Pakistani government's push for reduced fuel costs and improved efficiency for power plants across the country. Under contracts totalling more than US$14m (EUR10m), GE is upgrading four GE Frame 9E gas turbines that were installed at the KAPCO plant nearly 22 years ago. The upgrade of the first unit has been completed, and the upgrades for the remaining three machines are scheduled for completion by late 2011. When the total project is completed, overall plant net combined-cycle efficiency will increase, while the output of each gas turbine will increase by 3MW, for a plant total of 12MW - enough additional power for 800,000 homes. "Our goal was to improve the gas turbine heat rate to get increased plant efficiency, and GE offered the best solution to meet our requirements," said Naeem Ahmad Tariq, senior manager maintenance of KAPCO. "The fuel savings that will be realised due to the higher efficiency and the additional output will generate additional revenue of US$1.5m/y (EUR1.1m) for each gas turbine." The increased plant output will help KAPCO respond to Pakistan's growing electricity requirements. According to government estimates, the gap between supply and demand during peak load periods is 5GW, and the country's annual average growth in power demand is 8 per cent. 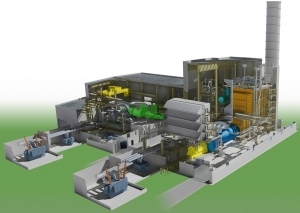 Alstom has commissioned unit 8 of the TPP-26 cogeneration gas combined cycle power plant in Moscow, in Russia, on behalf of its client OJSC Mosenergo, Russia's largest fossil fuel based power generating company. With an efficiency of 59%, the gas fired cogeneration combined cycle unit will have the highest efficiency of any combined cycle power plant in Russia, while the use of surplus steam for district heating will bring the plant's overall fuel utilisation to well over 85 per cent. The integration of unit 8, designed to produce 420MW of electrical power and up to 265 MW of district heating, will bring total plant output up to 1830 MW making the TPP-26 plant a pivotal contributor to the Russian grid as well as a valuable source of district heating. In 2007, Alstom was chosen by Mosenergo to be the first foreign enterprise to build a combined cycle plant in Russia on an EPC basis, making Mosenergo Moscow TPP-26 unit 8 Russia's first turnkey energy project to be handed to a non-Russian company. Mosenergo is a subsidiary of Gazprom, the largest extractor of natural gas in the world and the largest Russian company. Meanwhile Alstom's Thermal Services unit in Hungary has successfully completed modernisation of unit 8 of the Dunamenti gas-fired power plant owned by Gaz de France Suez. The modernisation project awarded to Alstom in 2008 included the retrofit and upgrade of the complete steam turbine island and the associated balance of plant at unit 8 of the plant to match the new steam data following the installation of a gas turbine from another vendor. The project started in April 2009 and has been successfully completed with the commissioning of the retrofitted unit 8 in July this year. It has contributed to the increased output of unit 8 from 215MW to above 400MW and a jump in efficiency from 36-57 per cent. The efficiency increase also results in a substantial reduction of carbon dioxide emissions from the plant. This project was a brown field investment, whereby the steam turbine island unit no 8 was modernised by using the power plant's existing infrastructure. The six conventional type 215MW steam turbines at the plant including the related condensers and feedwater heaters were originally supplied by Alstom companies. Within the scope of this project, Alstom replaced the high-pressure steam turbine in unit 8 with a high performance new module and upgraded the medium and low-pressure cylinders, the generator and the balance of plant - thus enabling the turbo group and its auxiliaries to operate in a highly efficient combined cycle mode. For its part, Siemens has announced that it is teaming up with the Russian company Power Machines OJSC within the next few months to set up a gas turbine joint venture, in which Siemens will hold a 65 per cent stake and Power Machines the remaining shares. The joint venture headquartered in St Petersburg is intended to perform engineering, manufacturing and servicing of gas turbines in Russia and the other countries within the Commonwealth of Independent States (CIS). The new company is scheduled to start operations as soon as the official permits have been issued. "The new joint venture will enable us to better serve the growing market for gas turbines, and gas power plants and combined cycle power plants in the CIS," said Michael Suess, ceo of the Siemens energy sector. "We're investing in Russia to build up production capacity for leading-edge power plant technology. We want to make our contribution toward modernising the power industry in the region, and our target is to strengthen our position as market leader. For us it is extremely important to be active in Russia as a local player," Suess added. In a separate development, Siemens Energy has received an order for the supply of three industrial gas turbines to Tanzania. Siemens' customer is the Norwegian company Jacobsen Elektro, which will build a power plant for the state-owned energy provider Tanzania Electric Supply Company Limited (TANESCO). The three SGT-800 gas turbines will be supplied to the Ubungo power plant located in Dar Es Salaam, the largest city in Tanzania. For the Ubungo power plant, Siemens will supply three SGT-800 industrial gas turbines with a combined capacity of 100MW. Connection to the grid is planned for late 2011. The natural gas for the power plant is supplied through a pipeline from the Songo Songo gas field off the coast of Tanzania. "With our gas turbines we can support the development of a reliable power supply in Tanzania," said Markus Tacke, ceo of the industrial power business unit of Siemens Energy. In Tanzania, fewer than than 10 per cent of the population of 40 million has access to the national power grid. The country depends mainly on hydro power, with only a few gas-fired power stations in place.